Happy Valentine's Day! I originally posted my Valentine's Tablescape a couple weeks ago but thought it would be perfect for a Chari's Sunday Favorites post. I apologize if you have already seen it..but this was one of my favorites ! I'm particpating with Susan at Between Naps on the Porch for Tablescape Thursday. I have so much fun putting a tablescape together and with Valentine's quickly approaching I thought I better get in gear and get busy on a Valentinescape. So I started playing with my dishes and to my surprise I had everything on hand to create a red and white theme...well almost everything..I did need some fresh flowers. These placemats and matching napkins were purchased in the most beautiful shoppe in Carmel last year. These were on sale and I loved the print and rich colors. I used my faux pearl braclets again for napkin rings! My napkins wear them as much as I do. My favorite red goblets...I love the bubbles in the glass. The flatware is King Cedric-Oneida. I layered a portugal charger, then my Lenox "Butterfly Meadow" salad plate and topped it with a white sunflower bowl. It still needed more red so I found a set of fun little bowls I bought at Christmas just because they were so cute..a polka dot and a stripe. I finshed the table with a white votives candles in crystal holders and a red and white bouquet of flowers. added two heart shaped ramekins from Target (their favorite store) filled with chocolate truffles just for them. So now I have two looks for this place setting...a heart shaped ramekin or a cute little polka dot bowl as a finishing touch. I must say I really do like the little ramekins too. Those little lovebirds really like dining by candlelight! Oh so very pretty Sonia! I just adore a red and white tablescape. You created a showstopping thing of beauty here. Your placemats are gorgeous in all of the warm colors. Love them! I have the same goblets in green and adore them as well. They are just lovely in red. It's all fantastic, elegant and very creative! Beautiful table, Sonia! Those placemats are beautiful! Great find! Both the polka dotted bow and the little heart ramekins filled with truffles are wonderful! I love your romantic table with touches of whimsy! Love and laughter is always a great mix! Very "Valentiney" :) You did a great job with your reds and whites. Pretty! oh so pretty~! loving those placemats.. You did good, Girlie..
Beautiful, beautiful table! do I still see your Christmas tree up! How long do you keep it up? I know some people decorate it for V-day, do you? Love it! I am partial to red anyway since my kitchen is done primarily in red. Oohhh...what a gorgeous Valentine's table!!! Of course, you know me...I love all that red and white! Girlfriend, I love those red floral placemats and matching napkins...I'd love to have a set of those for my red dining room! They sure make for a beautiful Valentine's place setting!!! Love how you layered the red and white dishes...simply gorgeous!!! Ohhh...and I love the little red polka dot and striped bowls...too cute! But I must admit that my favorite is the little red heart ramekin!!! I love hearts!!! Your fresh flowers...magnificent! They are the icing on the cake...to your fabulous table! This is just sooo pretty, my friend! Now...you and your honey enjoy this romantic Valentine's table for two!!! So happy that you dropped by and took a peek at my latest thrift store finds! I always love when you come for a visit!!! You have captured my heart with this wonderfully beautiful tablescape! I simply adore red and white. And then you added the red and white polka dots, my very favorite! So this was a true gift for me to scroll through and read with my coffee this morning! I love your place mats too. So pretty just the perfect color for me. I love red. Beautiful table and the perfect setting for your valentine. I have some sets of the same little bowls with the dots and stripes. They are such fun to mix in with things. Thanks for sharing. Polka dots, pearls and paisley....how very perfect together! The table setting is gorgeous. sonia, i'm just saying...you may need to frisk me before i leave your blog because i adore your table!!! those placemats...those dishes....ooooo. Your table is absolutely gorgeous! I love the bubble glasses also! the placemats are perfect! Great job! I love the red plates , ohh & the red poka dot bowls, the white sald plates are the cutest things! I love it all! Oh what a sweet Valentine's table -- It looks like the target love birdies will have a wonderful Valentine's celebration on your pretty table. Now THIS is what I call a GORGEOUS VDAY tablescape!! Beautiful VDay table, so warm and inviting. Thanks for stopping by. This is such a lovely table! Ohhh...I'm soooo glad that you decided to share your beautiful Valentine's table with us for Sunday Favorites! It's gorgeous and definitely deserves a second showing!!! You know, it's funny...I was reading my comment from before...I would have to say "ditto" again! Hehe! One thing that I didn't mention was how much I liked how you layered your dinner napkins...sooo pretty! Well Sweetie, I'm sending my very best wishes to you and your honey for the best Valentine's day ever! Enjoy!!! 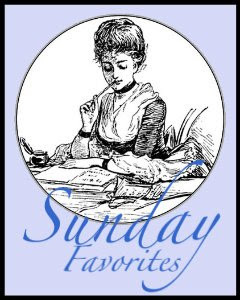 And thank you again for participating in Sunday Favorites! What a beautiful table. It must be a lot of work to make all of those reds match perfectly. Ya done good!!! The only kind of tablescapes I make around here involve fast food bags and our comfy chair/couch in front of the TV. HOWEVER - - - if I DID act like a classy lady and make a tablescape for Valentine's Day, I would want it to look JUST LIKE these individual place settings. Sooooo cute - - - and I want the chocolate in that little heart too. Your Valentine's tablescape is lovely! I really love those placemats and napkins! Thanks for sharing it with us again!